It's all about gimmicks at the movie theaters these days with the majority of "blockbusters" getting the third dimension treatment (you know it's reached the uber over-saturation level when Glee goes 3D). Well it turns out The Weinstein Company wants in on the action, but The Artist has its own unique gimmick - one that hasn't been used since the early 1930's - it's a silent film and it's nothing short of sensational. The movie opens up in 1927, when silent films ruled the cinemas - orchestras adding the soundtrack - "intertitles" popping up when deemed necessary. The Clark Gable-like George Valentin (a stellar Jean Dujardin) is the man that makes loads of cash for Kinograph Studios - that is before the advent of "talkies". Whether from pride or otherwise, the sudden transition from silence to sound leaves Valentin on the sidelines thanks to his emphatic rejection of the new technology. It's a paradigm shift that gives rise to a crop of new stars - including Peppy Miller (a vivacious Berenice Bejo) - a starlet that got her start thanks to an assist from none other than Valentin. At its heart, The Artist is a love story about George and Peppy - his star falling faster than the stock market crash of '29 - her's ascending higher than the Empire State Building. While director Michel Hazanavicius tends to follow the typical movie treatment for romantic dealings - the fact that it's all wrapped in a swath of silence makes The Artist such a unique and revelatory experience. 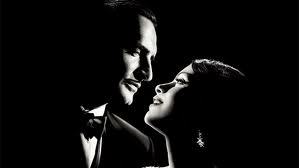 The Artist is sure to get a major push for Oscar and while some will say it's for the novelty of the experiment, in actuality, it's about the achievement. Creating something that feels fresh nowadays is tantamount to solving the current financial crisis - can't be done. But while Wall Street may be utterly out of touch with Main Street, The Artist and it's retro-retro take oddly delivers the most important element of the moviegoing experience, what all of us want as the lights go down in the theater, to be entertained.